POPULAR PROTESTS ARE SPREADING ACROSS CENTRAL AMERICA, AND WASHINGTON IS GETTING NERVOUS | "Global Possibilities"
As mass mobilizations sweep Guatemala and Honduras, the US prepares its usual response: Send in the military. Street protests over “corruption” in Latin America are often expressly reactionary. Very similar to Tea Party mobilization in the United States, middle-class unease with the redistributionist policies of the region’s center-left governments is leveraged by conservative economic and political elites, and cheered on by the monopoly corporate press, both in country and in the United States (and are often funded by “democracy promotion” organizations based in the United States—either that, or the Koch brothers, who seem to be running their own foreign policy in Latin America). Gianpaolo Baiocchi and Marcelo Silva noted that government protesters in Brazil last year were well-heeled and light-skinned. They are also color-coded, with would-be regime topplers agreeing to don some royalist hue, usually white but sometimes blue. Bolivia, Ecuador, Chile, Argentina, Paraguay, and, of course, Venezuela, have all witnessed very similar “wretched of the gated community” revolts. Ecuador’s les mis-libertarians are trying to get one started now to derail Rafael Correa’s effort to put into place a progressive tax structure (based on Thomas Piketty’s analysis of concentrated, inherited wealth). It was such a “white revolution” which in 2009 brought down the reformist government of Manuel Zelaya in Honduras, in a coup that, as e-mails reveal and the Intercept reports, Hillary Clinton’s State Department (back-channeling through that horrid Lanny Davis, who was on the coup’s payroll) quickly came to endorse and support. That same year in Guatemala, a similar middle-class mobilization—comprising, as a Guatemalan friend put it disdainfully, los twitteros—nearly brought down a president whose reform program was even milder than Zelaya’s. But the script has flipped, in Central America at least. In both Guatemala and Honduras, credible accusations of corruption are spurring mass mobilization truly popular in their class composition. In response, Washington is reacting in its usual manner to such threats: more militarization. For Guatemala, the International Justice Monitor here provides a good summary of how the protests, which have already brought down a vice president and is threatening to do the same to the president, is intertwined with efforts to bring the country’ Cold War génocidaires to justice. And here’s a link to a Google News in Spanish-language sources on ongoing protest. Over the last decade or so, there has been increased opposition to intensified resource extraction–especially mines and biofuel. Until now, that opposition, though formidable, has remained regionalized. Now it is nationalized. Honduras has been deteriorating since the 2009 coup. Honduras has one of the world’s highest murder rates, and just 5 percent of these are solved (zero for murders of journalists). The post-coup government has led to the consolidation of police death squads, including a new, US-vetted and trained elite force of “Tigres” and the fascist-sounding “Guardians of the Homeland” program that indoctrinates kids ages 5 to 15 and teaches them how to use military weapons. The Tigres are basically drug runners, as this investigation has revealed. Then there’s revelations came earlier this year that shell companies had overbilled Honduras’s national health service (the IHSS) and then diverted as much as $300 million to the National Party (of both current President Juan Orlando Hernández and his predecessor, Porfirio Lobo). The IHSS lost money to spend on treating patients as a result; some eleven people died for lack of adequate treatment. The checks were cut in 2013, the same year as the fraudulent (but US-praised) elections that saw Hernández elected. The elections followed a bloody campaign season in which 18 leaders, organizers, and activists in the Liberty and Refoundation Party—LIBRE—headed by ousted president Manuel Zelaya, were murdered. The scandal was brought into Honduran living rooms through the courageous broadcasts of TV Globo’s David Romero, who displayed copies of the checks on the air. Romero also made other, more shocking revelations, including some that link this scandal to the Valles bust: Romero claims that officials with Honduras’s justice system confiscated a safe from the Valles that contained documents detailing other corrupt means that Hernández and the NP set up to fund themselves, but that these were covered up by the justice system. 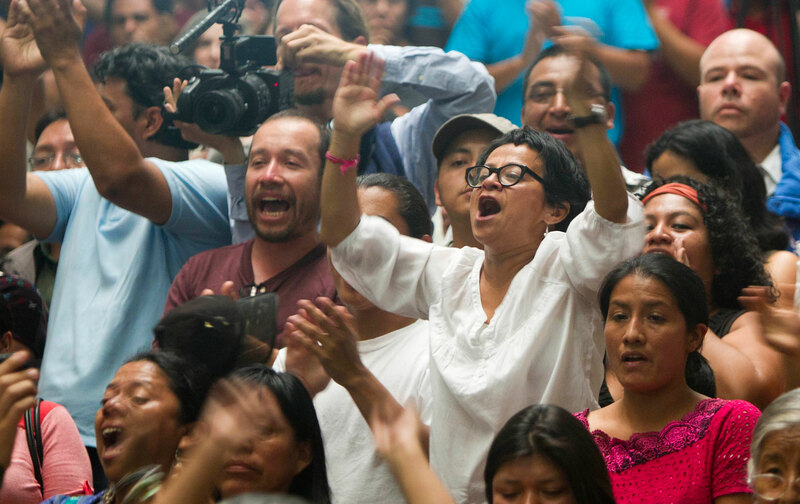 These scandals have led to major protests (which are increasingly synchronized with protests in neighboring Guatemala) by tens of thousands, targeting corruption at all levels resulting in part from the collapse of Honduras’s institutions following the coup. Some of the dismantling was done by Hernández himself, when he headed up the congress prior to his 2013 presidential bid. Hernández oversaw the removal of four Supreme Court judges after they found to be unconstitutional a new law that would pave the way for “Zones for Employment and Economic Development” (ZEDEs), also known as “model cities”—libertarian utopias that policy makers, guided by the likes of Grover Norquist, Michael Reagan, and Milton Friedman’s grandkid (! ), hope to scatter throughout the Honduras rainforest. Many basic constitutional and internationally guaranteed rights would officially not apply in the zones (think of them as a cross between Empire’s Workshop, Fordlandia, and the Shock Doctrine). The replacement judges did not object to the new legislation. Hernández admits his party is corrupt, but denied personal involvement. But potential witnesses against him are turning up dead. As with protests in Guatemala (“feeling of liberty that did not exist before,” The New York Times reports one observer commenting) the current mood in Honduras in jubilant. “Everyone’s in a great mood.… The political humor and popular culture [are] exploding like the glory days of the Resistencia,” a US colleague says from Honduras, referring to the protests that followed the coup. Morale has no doubt been bolstered by the death last week of Honduras’s richest—and perhaps most powerful—man, Miguel Facussé Barjum. Facussé was notorious for his empire of land holdings used for palm oil plantations, tourism projects, and other ventures aimed at squeezing Honduran resources to gain foreign dollars. Facussé, uncle of one of Honduras’s past presidents, was an important supporter of the 2009 military coup. That coup was about many things, one of which was a massive land grab. In its wake, Facussé made use of the military, and subsequent election of right-wing National Party governments (both via highly dubious electoral processes) to reverse gains made by campesinos and Afro-indigenous communities who had achieved legal claim to lands that Facusse coveted. That dispossession involved the International Finance Corporation, the business investment arm of the World Bank, which supported Facussé’s Dinant Corporation. The bloody conflict in Honduras’s Aguán Valley has claimed the lives of over 100 campesinos, and is the subject of a gripping new documentary film (available online here) by the terrific journalist Jesse Freeston, called Resistencia: The Fight for the Aguán Valley. Washington’s response to all of this is the Plan for the Alliance for Prosperity, showcased in a NYT op-ed by Joe Biden that held up Plan Colombia as the model. It’s really just the next stage in the “security corridor” the United States is building, running from Colombia through Central America to Mexico: a perfect machine of perpetual war. We might chuckle at the libertarian dream of starting year zero in Honduras, but, really, what the Obama administration is implementing is different only in scale: all of Central America as opposed to a few start-up cities.